"The Head of the Church — Jesus, the Christ. This simple statement reveals much about what we believe and who we are. Our principal text is the Bible, our worship is informed by the Book of Common Prayer (first ratified in the United States in 1789 and periodically updated). Cornerstones of our faith include a reverence for the past and a vision unto the Lord. Whenever you walk into Grace Church, we want you to feel welcome. We hope that your worship experience with us is spirit-filled and helps you connect with God. Please don’t hesitate to ask anyone you meet — the ushers who greet you, the other people in the pews or the clergy — if you have any questions. Feel free to sit anywhere. And if you have some time, please enjoy our historic building and our lovely stained glass windows. 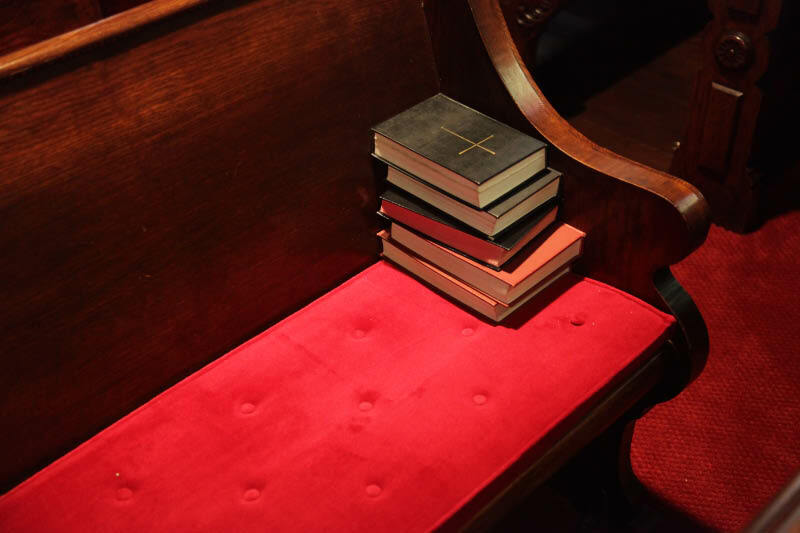 Attending one of our Sunday morning worship services is the best way to learn more about Grace Episcopal Church. 9 AM – Holy Eucharist is celebrated with a quieter service. There is music, but no choir at this service. 11 AM – Holy Eucharist is celebrated with full adult choir. 10 AM – Holy Eucharist is celebrated. This service allows our parish family to all worship together during the summer. Check the Grace calendar for updates on changes in service schedules. The nursery (with attendant) is open during all Sunday services. The Nursery is located in the Parish Hall. During the months of September to May, Sunday School is offered for youth during the 10:00 hour. Refer to the Sunday School page for further information. Beginning in September, we will have Youth Sundays on the third Sunday of every month during the 11 am service. There will be no Sunday School available on these Sundays and children will participate in the church service. You will find everything you need to follow the Sunday liturgy in the service bulletin offered by the ushers. The hymn numbers in the bulletin refer to the Hymnal that’s in each pew. Our Sunday liturgy usually follows Rite II in the Book of Common Prayer. Each service includes prayers, readings from the Old Testament and New Testament, a psalm and a sermon by the priest. The second part of the liturgy is the communion. At Grace Church, we believe it is the communion of all, so all are welcome to come forward and receive the bread and wine. If you do not wish to receive communion, you are welcome to come forward and receive a blessing from the priest — just cross your arms in front of your chest. If you are unable to come to the altar, please tell an usher so we can bring communion to you in the pew. The priest will place the bread in your hand. In receiving the wine, you can either drink from the chalice or dip the bread into the chalice.